Carcharodontosaurus is a monstrous meat-eating Theropod dinosaur and considered larger than T-Rex. In fact, it is often called the African T-Rex, although there is no relation. The name means “Shark Tooth Lizard” and Carcharodon, from the Greek, is the shark genus with similar teeth. The facts about this dinosaur are that it was first discovered in 1927 by Charles Deperet, in North Africa. 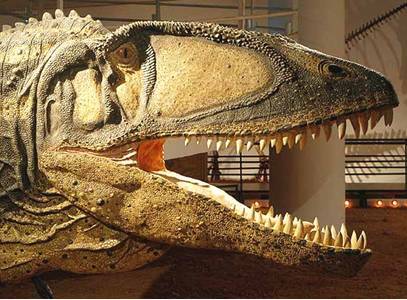 It was 36-45 feet (12M) long and about 6-8 tons in weight and it may have been nearly 17 feet tall. It had enormous claws and jaws with serrated teeth up to 8 inches long that could easily slice through flesh. The skull was 6 feet in length. This apex predator was from the Cretaceous Period which was about 98-93 Million Years old. Many fossil teeth come from the K’Sar-es-Souk Province, in Morocco, which is part of the Sahara Desert. It was, also, found in Algeria, Egypt, Libya, Niger, and Tunisia.